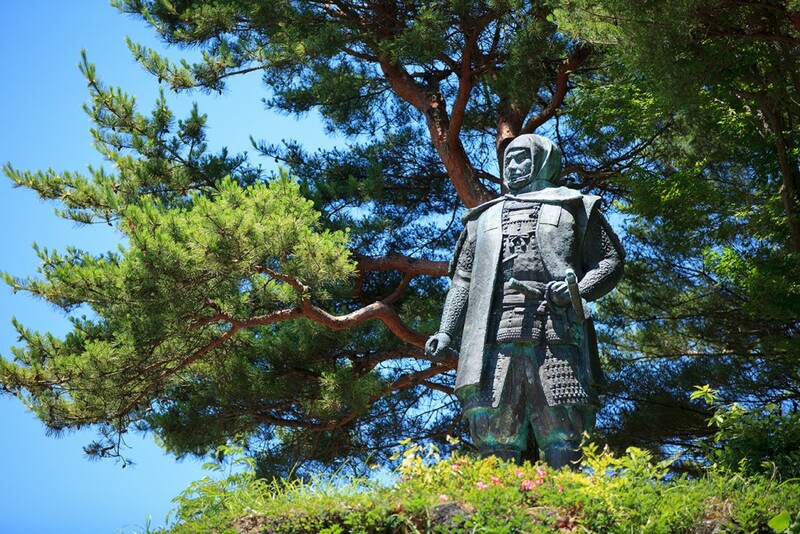 Uesugi Kenshin was born in Kyoroku 3 (1530) as a youngest child of Nagao, sub-military commissioner in Echigo. Another name he used in childhood was Torachiyo. In Tenmon 5 (1536) Nagao died, and his elder brother Ha continued the position of his father. As the same time, Torachiyo entered the Rinsenji Temple as a pupil and studied there from the age of 7 to 14 years old. His love of scholarship and deep religiosity, rare in the age of warring states, were nurtured in this period. After that he went through a "genpuku" celebration of adulthood in Tenmon12 (1543), and he was given the new name, Nagao Kagetora. He became a sub –military commissioner in place of his sickly brother. The military history of Kenshin began from his Genpuku coming-of-age celebration. Since then, he fought battles often with the great commanders of the age such as Takeda Harunobu (Takeda Shingen), Hojo Ujiyasu and Oda Nobunaga. However, these battles were not fought because of desire for glory, but rather out of a sense of duty and righteousness. The battle of Kawanakajima is especially famous. He fought over 5 times with Takeda Harunobu in Kawanakajima in support of Murakami Yoshikiyo and Takanashi Masayori, who had their territory robbed by Takeda Harunobu. There is also the famous episode when Takeda Harunobu, who had been Kenshin's enemy, had his supply of salt cut off by Imagawa Ujizane. Kenshin criticised the action and sent supplies of salt to Takeda Harunobu's territory. Raisanyo, a Confucian scholar during the Edo period, praised this act, and it’s said that the historical phrase “sending salt to the enemy” was born from this incident. The character of Kenshin's flag 「毘」, comes from “Bishamonten” a Buddhist diety. Kenshin believed deeply that he was the reincarnated God Bishamonten. He excelled in a fighting, but he was also an expert in Japanese poetry and calligraphy. He demonstrated his ability internal affairs and diplomacy. He recommended the cultivation of Aoso (blue ramie), which could be used to make clothes. It spread among the all of Japan through the Sea of Japan and became a good source of funds. He closed the curtain on his life after 49 years with his death in Tensho Year 6 (1578), but it was a life of continuous fighting and war. In that he went through life single and never took a wife, it can be said he was a unique Samurai warrior in the Age of Warring States. Joetsu is full of the historical sites, temples and shrines related with the life of Uesugi Kenshin. In addition to Kasugayama Castle, please visit the other places related to Kenshin dotted around the city.